New Google Add-Ons for Docs! 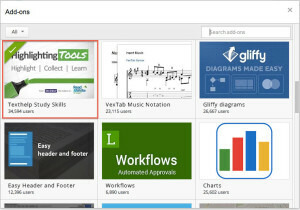 In case you haven’t heard, Google recently announced the availability of Add-Ons for Google Docs and Sheets. You can find the official announcement on Google’s Blog. 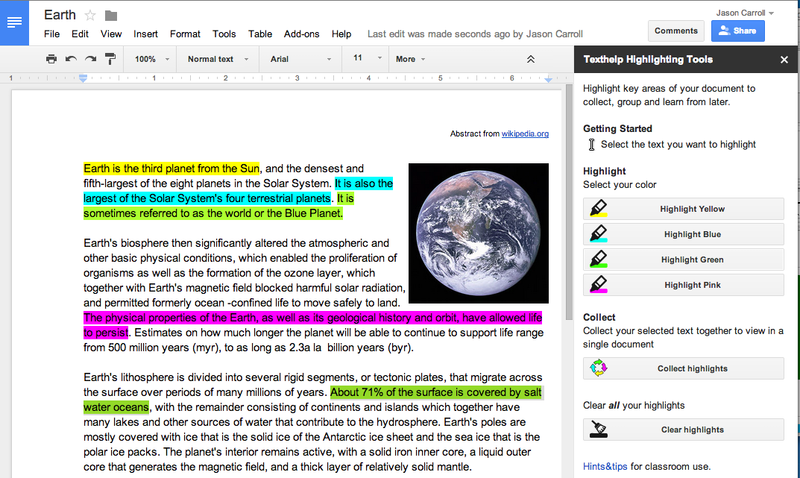 Texthelp is excited to be one of the first companies to offer an Add-On for Google Docs. 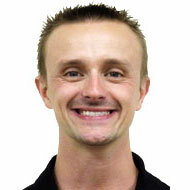 In this post I will be showing exactly how to find, install and use this new tool. Before you can install an Add-On you must ensure they are available to you. To do this, simply open a new Google Doc and click the “Add-ons” menu item (see image below). If you do not see this menu item keep checking. It is being rolled out gradually to all users and should be available everyone very soon. Assuming you do have access to the new menu item, simply click “Add-ons” followed by “Get add-ons” to view a new window containing available Add-Ons. To install the Texthelp Highlighting Tools Add-On, simply find the appropriate Add-On from the list (see option with red rectangle in image above), click the “Free” button to install (see below), then be sure to accept the permissions. You will then be taken back to your Google Doc and see a message that the Add-On has been installed. 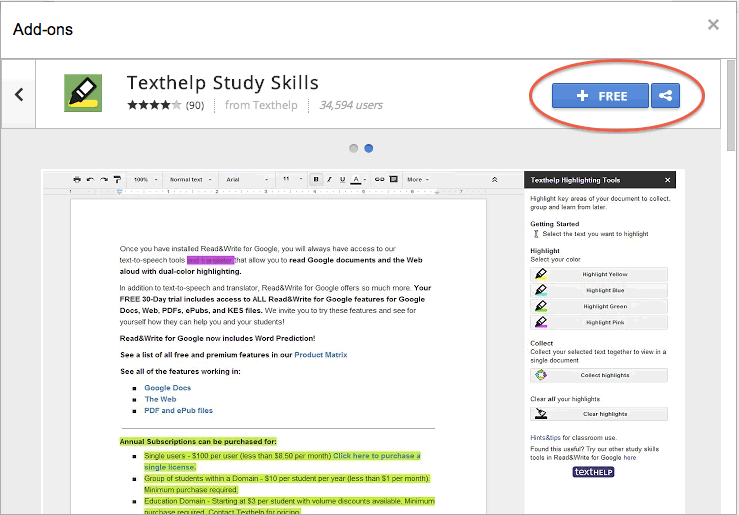 Now that your new Add-On has been installed you can access it from within a Google Doc by clicking the “Add-ons” menu item followed by “Texthelp Study Skills,” then “Show Highlighting Tools.” This will cause a new sidebar to appear. Using Highlighting Tools could not be easier. 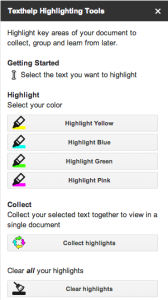 Simply select any text you would like to highlight and choose a highlight colour from the sidebar. Your selection will then be highlighted in that colour. 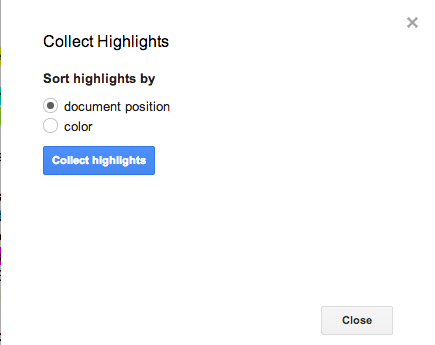 Once you are finished highlighting click the “Collect highlights” button. 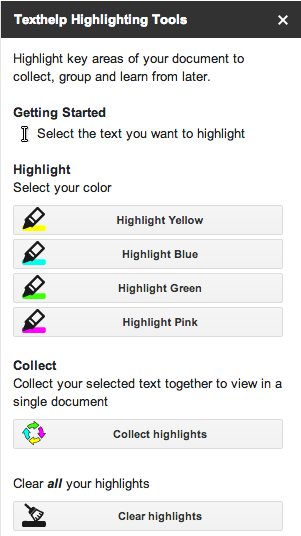 A pop-up window will appear asking if you want your highlights ordered by document position or by colour (see image below). 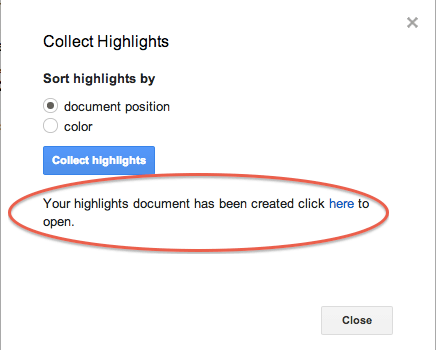 After making your choice, click “Collect highlights.” Your highlights will be created in a new document. You will be prompted to click a link when ready by a message in the same window (see circled text in image below). 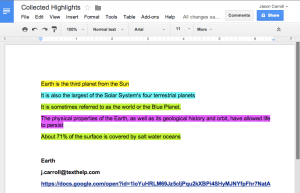 Clicking the link will open your new document containing your highlights. This document can be edited, printed, shared, or used in any other way you would typically use a Google Doc. 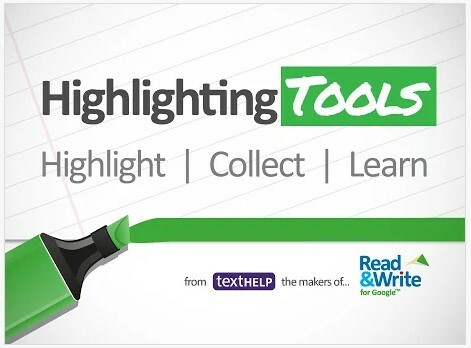 In addition to the features mentioned above, you can also choose to “Clear highlights” from the Highlighting Tools sidebar. 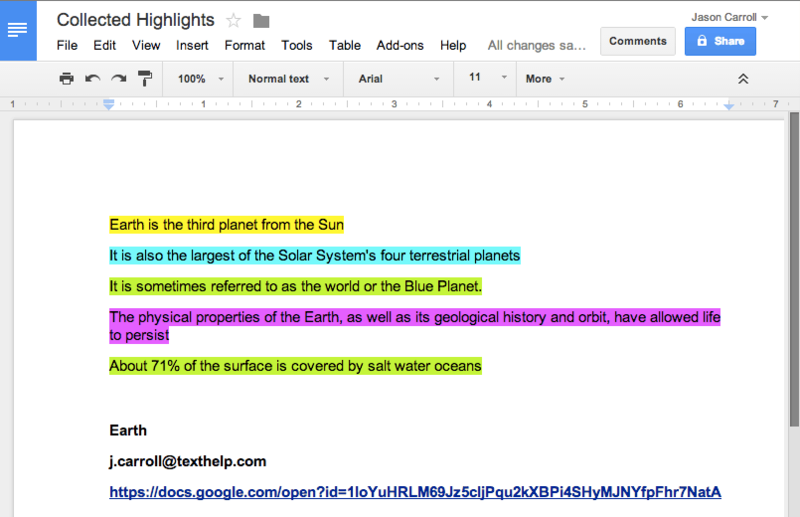 Note: Highlighting Tools are available free for 30 days. 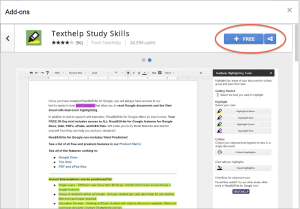 Once the trial ends, users can have continued access by purchasing a license of Read&Write for Google, a Chrome extension consisting of support tools for Google Docs, the Web, and other files such as PDF, ePubs, and more. 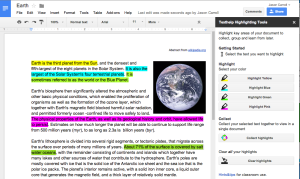 You can learn more about Read&Write for Google in the Chrome Web Store by Clicking Here. 2 Responses to New Google Add-Ons for Docs!